An Interview with Erin Lindsey + The Bloodbound Series Giveaway! Today it is with great excitement that I welcome back Erin Lindsey to The BiblioSanctum to chat about her latest novel, The Bloodsworn. And in case you missed my review of the book yesterday, I loved it! 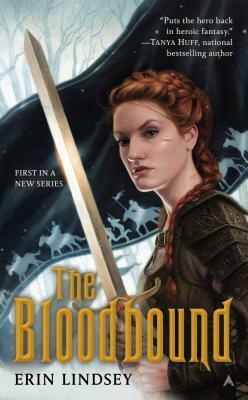 The Bloodsworn is available in stores now, concluding her fantasy adventure series The Bloodbound trilogy, so there’s no better time to read these books. We’re also honored to be hosting a US/Canada giveaway of all three books in the trilogy, so don’t forget to check out the details after the interview. Please enjoy our Q&A! Welcome back to The BiblioSanctum, Erin! It’s always a pleasure to have you stop by. Happy book day, by the way! Huge congrats on the release of your new novel, The Bloodsworn. 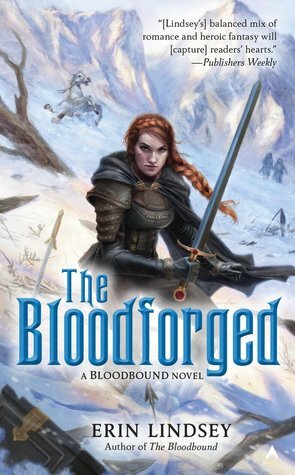 Since it’s the third installment of the Bloodbound trilogy, can you kick us off by giving us a brief rundown of the series and what prospective readers can expect when they pick up these books? I think the main thing to know going in is that although the series is variously billed as epic fantasy or fantasy romance, it’s really a character-driven narrative first and foremost. So while I like to think that the setting is rich and the plot is immersive, my number one goal was to create engaging characters and relationships, and focus on how those are shaped by the big events going on around them. Ever since the first book, I’ve been dying to ask how these stories and characters came about for you. What was the creative process behind the development for this series? Do you remember when you first got the idea? And what was the impetus behind some of the magical elements in the books, like bloodbound weapons or blood sorcery? The genesis of these books is actually kind of a weird story. It started as a writing exercise to keep the creative juices flowing while I was posted in South Sudan for work. Juba isn’t the kind of place that offers a lot in the way of entertainment, so I amused myself by banging out this story about a rebellious noblewoman in the king’s army. I really never thought it would go anywhere. But by the time I was a few chapters in, I realized I was having a blast writing it, and that’s always a good sign that you’re churning out something that might actually be worth reading. So I started to take it a bit more seriously and pretty soon I had a manuscript. THE BLOODBOUND was the fastest thing I’ve ever written. Still is, four books later. In terms of the creative process, there was initially a hodge-podge of influences in there – history, movies, games, even a Disney flourish or two. One thing I set out to do very deliberately was add a love triangle in Book 1. Those have such a bad reputation, and it’s largely deserved; they’re so often angsty and drawn out, yet without any of the heavy consequences that come from real-life love triangles. But I was convinced that if it was handled honestly and, dare I say it, maturely, it could offer some powerful insights into the characters involved. And I think that’s what happens in this series, especially because the triangle itself is resolved relatively quickly and the rest is actually about the aftermath – the consequences of Alix’s choice in Book 1, which reverberate through the rest of the series. Yes, I’m totally with you on the relationships being everything. So let’s talk characters! The inseparable trio of Alix, Liam, and Erik have been at the center of this trilogy since the beginning, but over time you’ve also added quite a few members to the very diverse and interesting supporting cast. Are there any particular characters, major or minor, who are particularly near and dear to you, and why? Ugh, that’s like asking someone to pick one of their children! It’s a boring answer, but I really have come to love them all. Alix for her fierceness, Liam for his warmth and self-deprecating wit, Erik for being such a heartbreakingly good man. One character who really grew on me was Vel. She was tricky at first. I couldn’t figure out what made her tick. But once I did, I realized she was one of the most complex, conflicted, and interesting characters in the mix. Her relationship with Rig just worked – which made it great fun to put her in Alix’s hip pocket for the bulk of Book 3. Adventuring with your big brother’s scandalous lover… awkward! And then there’s Rig. He seems to have stolen everyone’s heart, including mine. There’s just something about an Alpha Male, isn’t there? Especially one who’s laid back on the surface but a boiling pit of lava underneath. I honestly didn’t expect him to be so charismatic, but he was undeniably the breakout star of THE BLOODFORGED. That’s the thing about characters, though – they take on a life of their own so quickly. Haha, yeah, I had a feeling that might have been a cruel question, asking you to pick favorites, but I think you covered everyone’s strengths nicely. From the acknowledgements page, I know that writing this trilogy was an important journey for you. How does it feel now to have completed it? Bittersweet, definitely. It feels like an accomplishment, but I don’t want to leave these characters behind. There is so much more story to tell, and the more time I spend with them, the more true that feels. But who knows – if the series does well maybe there will be more. So, you know, if readers want to see more they should talk it up on Amazon and social media (*cough* hint hint). What were some of the best moments for you when writing this trilogy? And on the flip side, what were some of the most difficult challenges? Writing Book 3, THE BLOODSWORN, was really cathartic. Certain scenes in that book are just… oof. And I’d grown so attached to the characters by that point that I became quite emotional writing them. I think I cried about three times. Not always sad tears, either; sometimes the scenes were just… emotional. It’s honestly not an experience I’ve had with other books I’ve written, so it was pretty intense – in a good way. There were tough moments too. THE BLOODFORGED was by far the most complex plot I’ve ever crafted, in the sense of having three separate storylines told from four very different POVs, all of which needed to come together by the end. It was also darker in tone, very Empire Strikes Back, and it’s a tricky balance – upping the stakes and making things appropriately dire without completely bumming out your readers. THE BLOODBOUND was pretty upbeat overall, so I think I challenged readers a bit with Book 2 and really asked them to trust me that the payoff in Book 3 would be worth it, just that much more intense for having been an investment. The trilogy may be over, but do you think you will ever revisit this world in your writing? I hope so. There’s a lot more story to tell, as I mentioned before. I’m also toying with the idea of doing some free content on my website. I think it would be a lot of fun if I could find the time to do it, and if there was enough interest to make it worthwhile. Aside from The Bloodbound trilogy, you’ve also written the fantasy mystery Nicolas Lenoir novels under the name E.L. Tettensor, and the two series are very different in tone and style. What is it like to switch between genres? And are there also other genres you’ve considered writing? They certainly are different, and I admit I did struggle sometimes to switch gears, like when a Lenoir book came back for edits while I was smack in the middle of a Bloodbound book, or vice versa. It would always take me a few days to adjust. That being said, having written a couple of mysteries sure came in handy while I was writing THE BLOODFORGED, since Liam’s storyline is basically a mystery at heart. As for new stuff, I’ve found a blend of the two styles in my latest project, which is a fantasy mystery with a very light tone and a good hit of romance. I’ve really enjoyed playing in that sandbox, so I might stick around there for a while. It’s been great talking with you, Erin! To wrap things up, can you please leave readers with three things that they might be surprised to learn about you? I spent more than a decade working for the United Nations. My worldbuilding tends to draw heavily on Africa and Central Asia. Thank you so much again for the interview! Where can readers find out more about you and your books? 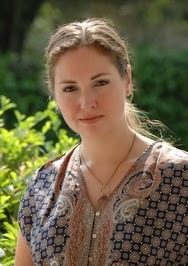 You can find me on Twitter and Facebook, or at my website, erin-lindsey.com. Stop by and say hi! 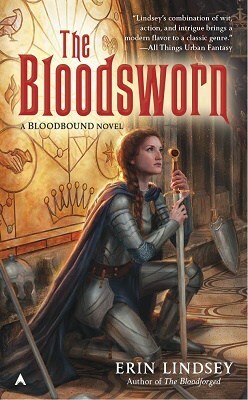 Interested in The Bloodsworn, or thinking about checking out the The Bloodbound series from the beginning? Well, you’re in luck! With thanks to the publisher, the BiblioSanctum is pleased to be hosting this giveaway for a chance to win all three books in this amazing trilogy. This giveaway is open to residents of the US and Canada. One lucky winner will receive a set of books containing The Bloodbound, The Bloodforged, and The Bloodsworn. To enter, all you have to do is send an email to bibliosanctum@gmail.com with your Name and valid Mailing Address using the subject line “THE BLOODBOUND TRILOGY” by 11:59pm Eastern time on Friday, October 7, 2016. Ohhhhh I don’t think I’ll be able to resist this giveaway. 🙂 I remember Mogsy’s (?) review of the first book being very positive, so that’s enough reason for me to give it a try. Great interview, btw! I love the enthusiasm in Erin’s answers and the insights into her writing process. I love it when authors get really excited about the books they’re writing. Erin’s enthusiasm definitely makes me want to read this series!